Modern day manga (漫画) can be defined as comics corresponding to a Japanese style which originated during the mid-1900s. The popularity of manga in Japan has since ballooned. Today, there is a huge domestic industry for manga, and increasingly so internationally. In Japan, people of both genders and all ages read manga. For example, it is quite common to see business men in suits reading thick comic books in commuter trains. The range of manga genres is diverse, with content ranging from history to futuristic science fiction and from teenage romance to profound themes about life. The comics are broadly separated into four categories according to the target audience: boys, girls, youths and matured. They can be commonly found in bookstores, bookstands and convenience stores all over Japan. A manga series may become popular enough that it is made into an anime (アニメ) - Japanese styled animation. Examples of world famous anime include "Dragonball", "Sailor Moon", "Pokemon" and "One Piece". Of course, original scripts may also be written for anime. One popular anime production company with its own distinct style is Studio Ghibli, which has produced award winning works such as "My Neighbor Totoro" and "Spirited Away". 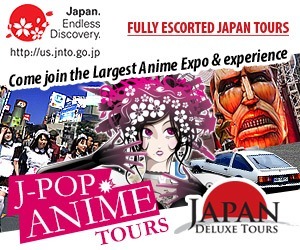 The popularity of manga and anime in Japan has led to the establishment of many related attractions and places of interest. In Tokyo, some of the world's largest comic events are held annually. Manga cafes are places where customers can read from a library of manga for a specified time at a corresponding fee. Guests are free to borrow and return books as many times as they wish within the time limit. Many manga cafes also allocate individual compartments, offering guests some privacy for their reading pleasure. Manga cafes can be found at almost all major city centers, usually located close to the train stations. Big cities such as Tokyo and Osaka have a large number of such establishments. Many of them offer a free flow of non-alcoholic drinks and double as internet cafes. Charges are typically about 300 yen per 30 minutes, but most offer packages such as three hours for around 1000 yen. Maid cafes were originally created to fulfill the fantasies of fans of maid-themed manga and anime. The concept originated in Akihabara at the dawn of the millennium. Ever since, multiple maid cafes have been opened in the area, making Akihabara by far the best place to go for a maid cafe experience. The success of the cafes have inspired emulations at other locations in Japan and other countries such as Taiwan, South Korea, China, Canada and the United States. The primary characteristic of maid cafes are the waitresses who are dressed typically in costumes as French maids. Food and desserts served at the cafes are usually decorated in a cute way. The waitresses role-playing as maids may engage in friendly conversations or play card/video games with the customers to make them feel at home. Picture-taking is usually forbidden, but some cafes allow customers to have their picture taken with a "maid" for an additional fee. A few manga and anime grand events are held in the course of a year. In particular, the AnimeJapan (formerly known as Tokyo Anime Fair), held annually at Odaiba's Big Sight convention center, is one of the largest animation related events in the world. Another noteworthy event is Comiket, a huge comic book fair which attracts hundreds of thousands of people. It is held biannually, also at Big Sight in Tokyo. Akihabara is the center of gaming, manga and anime culture in Japan. With its electronics shops, maid cafes and anime stores, it is a paradise for any self-proclaimed otaku. Stores are typically open from 10:00 to 20:00, although individual store hours vary. Nakano Broadway is a shopping mall with a large concentration of stores specializing in anime goods, including numerous specialized branches of the Mandarake store. Items on offer include a wide selection of figures, toys and costumes. Stores are typically open from 12:00 to 20:00, although individual store hours vary. Found in major cities, including Sapporo, Sendai, Tokyo, Yokohama, Nagoya, Osaka, Hiroshima and Fukuoka, Pokemon Centers are stores where you can buy all things Pokemon like trading cards, stationery, toys and games, including some exclusive items. Located inside the building at the base of Tokyo Tower, this indoor amusement park is themed after the popular One Piece manga series. It offers a variety of shows, games and other attractions that feature the series' characters. Located near Mitake Station, a little bit outside central Tokyo, the Ghibli Museum is home to the favorite characters from Ghibli Studios films such as My Neighbor Totoro, Princess Mononoke and Spirited Away. The museum features special animation exhibits and exclusive short films. Advance reservations are required to visit the museum. The Fujiko F. Fujio Museum, informally known as the Doraemon Museum, shows the work of manga artist Fujiko F. Fujio, creator of the influential and long running Doraemon series. The museum is located in Kawasaki next to Tokyo and requires advanced reservations. This museum is dedicated to the manga creator Ishinomori Shotaro, a prolific artist who drew several dozen influential manga series including Cyborg 009 and Kamen Rider, and displays a collection of comics, statues and artworks from his numerous manga series. The museum is located in Ishinomaki near Sendai. It was damaged by the 2011 tsunami but has since been repaired and reopened. The Kyoto International Manga Museum is centrally located near Karasuma-Oike Subway Station and displays a massive collection of manga available for browsing. It also focuses on both the adoption and development of manga internationally. The Kitakyushu Manga Museum introduces the history of manga with a focus on artists who have affiliations to Kitakyushu City, including Matsumoto Leiji, the creator of Space Battleship Yamato and Galaxy Express 999. The museum is located in Aru-Aru City, a shopping center that also features several manga and anime related shops.